Football is a 365 day a year game. A day by day reminder of some of the famous, record-breaking or bizarre things that have happened in the month of October over the years. After weeks of speculation and waiting Arsène Wenger finally has his first day in charge of Arsenal. He was not a universally popular appointment. Ex Barcelona manager Johan Cruyff had been favourite for the job so the appointment of an unknown Frenchman managing Grampus Eight in Japan was met by a London Evening Standard headline of ‘Arsene who?’ and a nation trying to come to terms with how to pronounce his name. Things would change! They say don't mix sport and politics but that's often far from possible. That was the case in the Barcelona area on 1st October 2017 when the people of Catalonia were voting in a controversial referendum to decide if they would declare independence from Spain while FC Barcelona (Barcelona is the capital of Catalonia) were due to entertain Las Palmas in La Liga. Expecting tensions to be high FCB requested that the match be postponed but that request was refused. On 1st October tensions were indeed high and with chaotic and violent scenes in Barcelona the football club considered calling the match off. But that would have risked suffering a 6-point penalty so instead shortly before kick off they decided to play behind closed doors. Average home League attendances up that point of the season had been over 50,000. Even an empty Nou Camp didn't stop the conflict. One fan did get in and promptly 'invaded' the pitch while the two clubs had opposing views on the referendum. Las Palmas were firmly in the 'stay' camp and had the Spanish flag and date printed on their shirts while Barcelona were in the 'leave' camp and used their scoreboard to promote their message. Barcelona won the football match 3-0 and the separatists were victorious in the political vote and from then on you just knew that Brexit would be sharing the news summaries with a new story! Two well known names in the national game made their debuts for England away to Northern Ireland in the Home Championship, scoring a goal each in England's 2-0 victory. Fulham's Johnny Haynes went on to play 56 times for England, 22 as captain and although Don Revie of Manchester City only won 6 caps he later went on to manage the national team. England played their first match in the European Championship - then the European Nations Cup - a first leg qualifier against France played in front of 35,380 at Hillsborough. A Ron Flowers penalty gave England a 1-1 draw. Walter Winterbottom was in charge for that match but Alf Ramsey made his debut as England manager when the second leg was played the following February in Paris - but England lost that one 5-2. When a club draws the away leg of a two-legged cup tie the belief is always going to be that they must surely start as favourites for the home leg. But that isn't always the case! When Fourth Division Aldershot drew 0-0 at Hillsborough in the first leg of the 1989/90 Littlewoods Cup (League Cup) Second Round tie their fans had high hopes for their home second leg match especially as Sheffield Wednesday had only scored twice in their opening nine competitive matches of the season. But things didn't work out like that. On October 3rd 1989 Steve Whitton scored 4 and Dalian Atkinson 3 in Wednesday's 8-0 victory at the Recreation Ground which became the new record away win in the competition. Matt Busby is best known as a manager of Manchester United but as a player he made over 300 League appearances for United's great rivals Liverpool and Manchester City. He also made one full international appearance for his native Scotland - on 4th October 1933 - a 3-2 defeat by Wales in Cardiff in the Home Championship. Newcastle United fans thought of a novel way of protesting against their manager, Alan Pardew, on an away-day Premier League visit to Swansea City. They unveiled an apt banner - 'Not a Welsh town, our form in 2014' - which detailed their poor playing form in 2014, mainly Ls and Ds. It proved to be an immediate hit with the media although a few newspapers did spend far too long listing all the Welsh towns that don't have a vowel in their name! For the record it was another D that day (2-2) while Pardew stayed in the job for another 3 months before deciding that a move to Crystal Palace would benefit his career. After a £13,000 move from Bradford Park Avenue to Newcastle United Len Shackleton made his debut for the Magpies in a Division 2 match against Newport County on 5th October 1946 in front of a St James' Park crowd of 52,137. Newcastle proceeded to equal the highest score in Football League history with a 13-0 victory with new-boy Shackleton scoring six of them. A perfect debut or what! North West Counties League side Cheadle Town had their moment of fame on this day in 2014. Being warm-up opposition for the Russian Under-19 side who were preparing for a European Championship qualifying tournament in Northern Ireland was impressive enough but what got Twitter in a frenzy was the result. Cheadle lost 22-0. A first was recorded in the Division 2 fixture between Oldham Athletic and Manchester United on this date. Oldham's Sam Wynne became the first player to score two goals for each side in Manchester United's 3-2 victory. His goals for Oldham were from a free kick and a penalty. That has only been equalled once since - Aston Villa's Chris Nichol scored all four goals in the 2-2 draw at Leicester in March 1976. Andy Wilson scored all five goals for Middlesbrough in their 5-2 First Division victory over Nottingham Forest at Ayresome Park. Those goals helped him finish as top scorer for Middlesbrough in 1923/24 (8 League goals) despite moving to Chelsea in November for what was then a record Chelsea transfer fee of £6500. At Stamford Bridge he scored another 5 goals in 19 League appearances to finish as Chelsea's top scorer for the season as well. So top of the charts for both Middlesbrough and Chelsea - and both clubs were relegated that season. If that's not unique then I think that the fact that he played for Scotland against England at football and in later years for England against Scotland at bowls almost certainly is! Five days short of his 19th birthday Bobby Charlton made his League debut for Manchester United against Charlton Athletic, scoring twice in United's 4-2 victory in front of a 41,439 crowd at Old Trafford. In the return match against Charlton in February he scored his first League hat-trick in a 5-1 victory at the Valley. Bobby Charlton went on to make 606 League appearances for United scoring 199 goals in those matches, both being club records at the time. Hooliganism was a serious problem in the 1980s. Luton Town were particularly badly hit and their solution was to restrict entry to those who were signed up to the Luton Town membership scheme - and that effectively banned away supporters. Maggie Thatcher supported the Luton initiative but in September 1986 the Hatters were thrown out of the Littlewoods Cup (League Cup) for refusing to offer 25% of their tickets to visiting supporters in that competition. Luton suggested a compromise - playing home matches behind closed doors - but in a lively two-hour meeting at Villa Park on Monday October 6th 1986 the League clubs came together to decide on the matter. Two motions were voted on. The first - that only Luton club members would be able to watch League Cup action at Kenilworth Road in 1986/87 - was overwhelming rejected, by 80 votes to 6. The compromise offering was that Luton play their 'home' matches at a neutral venue or switched to the away venue. That was accepted but Luton declined that offer and confirmed their absence from the League Cup in 1986/87 giving Cardiff City a walk-over in the second round tie. Ironically two days later the FA accepted the ban on away supporters at FA Cup ties at Kenilworth Road although they gave other clubs the option of banning Luton fans in home FA Cup ties against the Hatters. David Beckham became a national villain when he was sent off against Argentina in the match that saw England eliminated from the 1998 World Cup but all that was finally forgiven on this day in 2001. England needed a win or draw against Greece in their final qualifier to automatically get to the 2002 World Cup finals. Sadly the match didn't go to script and in the 93rd minute Greece were leading 2-1 but then England got a free kick. From around 30 yards on his home pitch - Old Trafford - David Beckham fired in a perfect free kick which hit the back of the net. A 2-2 draw, Beckham a national hero, England qualified for the finals automatically and Germany finished second and went to the play-offs. Was it a dream? A World Cup qualifier against Germany seemed the perfect fixture for the final match at the old Wembley. But the twin towers didn't get the send off they deserved with a poor England display and a Dietmar Hamann goal giving the victory to Germany. Soon after the final whistle England manager Kevin Keegan said that he 'wasn't up to the job' and he resigned while in the Wembley toilets. There was a time when bomb threats were a not uncommon part of football. At a Euro Under 21 qualifier at Wolves a Molineux steward noticed a suspicious-looking foil-wrapped package. The police got involved, then the Army but after a controlled explosion it was found to be ......a sandwich. The crowd had waited outside in the rain, the match kicked off at 10pm, England missed a penalty and drew 0-0 with Poland. Happy days! The homecoming to Manchester of Real Madrid's David Beckham proved not to be a happy one. He was sent off after receiving two yellow cards in the World Cup qualifier against Austria at Old Trafford and so became the first player to be sent off twice while playing for England. He wasn't too chuffed! Gillingham suffered a nightmare journey to Barrow for a Fourth Division match. They arrived so late that the match had to be abandoned when Barrow were winning 7-0. A broken-down bus, a missed train, a chartered plan and a car dash didn't prove good enough to get the match finished before it got too dark (no floodlights at Barrow in those days). Aston Villa's attempt to fill what would have been a blank international weekend for the club with a prestige friendly back-fired, just a bit! The 'friendly' was against Scottish champs Rangers. Scots fans - many the worse for drink - descended on Birmingham causing problems in the city centre even before arriving at Villa Park. At the ground missiles were thrown onto the pitch, there were pitch invasions and battles with the police which left over a hundred spectators injured, including stabbings, and a similar number arrested. With Villa leading 2-0 the match was abandoned in the 53rd minute - and Rangers found it just a tad more difficult to play friendlies south of the border! Probably the most bizarre abandoned international was a Scotland World Cup qualifier. They were due to play Estonia in an evening kick off in Tallinn but after Scotland objected to the temporary floodlights as not being up to standard FIFA brought forward the match to an afternoon ko. Estonia were not too chuffed at that and when Scotland kicked off at the appointed time they were the only side on the pitch! To the chants from the 1000 or so present 'One team in Tallinn, there's only one team in Tallinn' the referee abandoned the game after just three seconds. The match was ordered to be replayed at a neutral venue (Monaco). AFC Wimbledon were formed in June 2002 by fans of Wimbledon FC after that club had decided to up-sticks and move to Milton Keynes to (eventually) become MK Dons. AFC started life in the Combined Counties League which was in the ninth tier of English football but by 2016/17 both clubs were together in League 1. On Sunday October 9th - when AFC won at Oxford and MKD lost at home to Port Vale - for the first time the phoenix club were above the original club in the League table. AFC occupied 10th spot in League 1, one point and two places higher than MKD. Rob Green is perhaps, sadly, best remembered to his gaff which gave away a goal to USA in the 2010 World Cup finals but on this day in 2009 he hit the headlines when he became the first England goalkeeper to be sent off. Playing in Dnipropetrovsk in a World Cup qualifier against Ukraine he was red-carded for a professional foul on Artem Milevskiy after just 14 minutes. He was replaced by David James, the spot kick was missed but England lost 1-0 although by then had already won a place in the World Cup finals in South Africa. Bill Nicholson started his new career as a manager on this day and watched his Spurs side beat Everton 10-4 in a First Division match at White Hart Lane. Not a bad debut! Northampton Town were the last League side to have its home at a cricket ground. The football pitch at the County Ground had the reputation of having the worst playing surface in the League, largely the result of the pitch being used as a spectator area/car park/picnic area during the cricket season, as shown in the picture. The Cobblers played their last match there on Tuesday October 11th 1994, a 0-1 Division 3 defeat by Mansfield Town. Four days later they drew 1-1 with Barnet in their first match at the Sixfields Stadium. The two goalkeeping subs named for the League 2 match between Carlisle United and Stevenage had a combined age of 95. An injury crisis saw the Stevenage goalkeeping coach, former England international Dave Beasant, on the subs bench 11 years after retiring from playing – at the age of 55! Tony Caig, Carlisle’s goalkeeping coach, was the Carlisle sub but being a mere 40 years old had been a regular on the Carlisle bench. Had he played, Dave Beasant would have been the oldest person to play in the Football League but as it was neither of the senior citizens took part in Carlisle’s 3-0 victory. Legendary Notts County goalkeeper Albert Iremonger was not too chuffed when the referee abandoned a First Division match at Tottenham due to fog with just 8 minutes remaining. Notts were 3-1 up at the time and were heading for their first League win of the season. The 6ft 5in goalkeeper's 'offensive remarks' to the referee saw him pick up a three match ban. When he started that ban two weeks later it ended an amazing run - he had been ever-present in the first team since February 9th 1907. In those 5+ years he had made 222 consecutive first team appearances for Notts County, 211 in the First Division and 11 in the FA Cup. That is still a Notts County club record. Scotland beat Wales in a World Cup qualifier to reach the 1978 World Cup finals in Argentina - and were the only British nation to qualify. Scotland's 2-0 win was helped along by a hotly-disputed penalty and the choice of venue. After crowd problems at an Wales match at Cardiff's Ninian Park the Welsh FA decided to stage the home match 'abroad' at Liverpool's Anfield Stadium rather than in Wrexham. Their were so many members of the Tartan Army in the 50,850 Anfield crowd it almost seemed to be an away match for the Welsh. In an attempt to increase interest in the club Brentford gave free admission to everyone who attended their Second Division match against Peterborough United on Saturday October 13th 2001. The 11,097 crowd (who would have paid about £70,000 if they had all been charged for entrance) was about twice the size of the previous home gate but sadly was also twice the size of their next game at Griffin Park. It was a season of nearly but not quite for Brentford finishing one point short of automatic promotion and then being beaten by Stoke in the Play Off final at the Millennium Stadium in Cardiff. Tofiq Bahramov will always be remembered with affection by England fans - he was the linesman who helped get awarded the controversial England third goal in the 1966 World Cup final. When his native Azerbaijan gained independence from the Soviet Union their national stadium was renamed in his honour complete with statue erected outside. England visited the stadium for the first time on this day in 2004 for a World Cup qualifier with captain Michael Owen scoring the only goal of the match. Jason Crowe didn't make the best of debut's for Arsenal in their 4-1 Coca-Cola Cup victory over Birmingham at Highbury. His debut lasted just 33 seconds before ref Uriah Rennie sent him off for a high tackle. The date of one of the best-known scorelines in the FA Cup - Preston North End 26 Hyde United 0 in a First Round tie at Deepdale. Not only was it the top score in the FA Cup but also the highest score in a senior match in England. Preston were the top-dogs of the day. They played in eight FA Cup matches that season (one was declared void) scoring 56 goals with Jimmy Ross himself scoring 20 of them, 8 of them in the Hyde match. They reached the final and legend has it they were so confident of victory they asked to have a picture taken of them with the FA Cup before the match was played. Referee Major Marindin said 'Had you better not win it first?' and of course Preston were beaten 2-1 by West Brom! The first attempt by an English side to win the Intercontinental Cup ended the same way as had Celtic's try the previous season - in a bad-tempered defeat by the champions of South America. After losing 1-0 in the first leg in Argentina - Nobby Stiles was sent off - European champions Manchester United met Estudiantes in the second leg in front of 63,500 at Old Trafford on this day in 1968. Juan Ramón Verón - the father of future United player Juan Sebastián Verón - scored for the visitors in the opening minutes, George Best was sent off and Willie Morgan equalised in the closing seconds so Estudiantes won the trophy 2-1 on aggregate. A gaffe from England’s David Seaman brought more criticism for the Arsenal ‘keeper when he allowed Macedonia’s Artim Šakiri to score direct from a corner kick. The 2-2 draw with Macedonia in a Euro qualifier at St Mary’s in Southampton proved to be David Seaman’s 75th and final appearance for his country. This I'm sure will never happening again. Just after the start of the 1919/20 season the footballing authorities closed down Leeds City and expelled them from the Football League with their fixtures being taken over by Port Vale. Their crime had been to make illegal payments to players during the First World War. That saw the need to auction off the club assets to pay the debts so on 17th October 1919 representatives of 30 League clubs assembled at the Metropole Hotel in Leeds to bid for everything from boots to goalnets to....the players! The Yorkshire Post newspaper described it as "a melancholy spectacle" as the playing squad was sold as if they were cattle. Billy McLeod was bought by Notts County for £1250, John Hampson (to Aston Villa) and Harold Millership (to Rotherham County) went for £1000 each while £100 was the bargain price Lincoln City paid for Francis Chipperfield. Their whole squad went for around £10,000. Almost slavery I would have thought but out of that hardship a new club was soon playing at the Elland Road home of Leeds City....Leeds United. Link - Leeds City expelled from the Football League. England needed to beat Poland in front of a 100,000 Wembley full-house to get to the 1974 World Cup finals, anything less then Poland would be there. In his pre-match analysis TV pundit Brian Clough called the Polish ‘keeper Jan Tomaszewski a ‘clown’ and so, inevitable, he produced a brilliant performance in the 1-1 draw. England were out of the World Cup and after two memorable World Cup final tournaments they found themselves as being just ordinary again. England played Russia on the artificial surface of the Luzhniki Stadium in Moscow and a 2-1 defeat was a major setback in their hopes of qualifying for Euro 2008. They eventually finished third in the group – behind qualifiers Croatia and Russia – and equal on points with Israel. England manager Steve McClaren only lasted another month in the job following the defeat in Russia. Second Division strugglers Stoke City paid £3,500 to buy a 46 year old player to improve their fortunes. It worked - the last home League match before he arrived attracted 8,409 fans but in the first match after he arrived 35,974 were at the Victoria Ground. The player they had brought back from Blackpool was Stanley Matthews who made made his League debut for Stoke back in 1932 and who would go on playing until he was 50. Amazing or what? Nowadays Andorra, Liechtenstein and San Marino are the countries who are the whipping-boys of European football but back in the 1960’s that honour belonged to Luxembourg alone. On this day in 1960 England visited Luxembourg for a World Cup qualifier and won 9-0, England’s highest score in the competition. Bobby Charlton and Jimmy Greaves each scored hat-tricks, Bobby Smith a couple of goals and Johnny Haynes one. Norwich City wouldn't perhaps be considered the most notable of English clubs who have played in European competitions but on this day in 1993 they did something no other English club ever did. The Canaries beat Bayern Munich in the Olympic Stadium, then Bayern's home ground, in the UEFA Cup. A draw in the return leg at Carrow Road saw them into the Third Round where they lost to Inter Milan. Wolves fan Peter Abbott – who lived in Ipswich in Suffolk – missed his first Wolves home match since 1976 when his step-daughter got married. Inconveniently for him the wedding was on the same day that Wolves entertained Coventry at Molineux although Wolves made clash less of a pain by sending along a surprise wedding guest - club legend Steve Bull. Not sure what the bride thought of it though! Steve Evans said that in April 2013 - and yep, as you've guessed, he was appointed manager of Leeds United on October 19th 2015! Leicester recorded their highest League score with a 10-0 First Division victory over Portsmouth at Filbert Street. Arthur Chandler equalled the Leicester individual record with six goals in that win which became known as the 'six swans match'. After Chandler had scored five goals five swans flew over Filbert Street. A sixth swan flew over shortly afterwards and the fans demanded a sixth goal from Chandler, which he duly scored. The First Division match between Manchester United and Arsenal became the 'Battle of Old Trafford' - or is that one of many 'Battles of Old Trafford!' - when a clash between Arsenal's Nigel Winterburn and United's Brian McClair erupted into a full-scale brawl involving 21 players, only Arsenal's 'keeper David Seaman watching on. As a result both clubs were charged with, and found guilty of, bringing the game into disrepute. Manchester United were docked one point and Arsenal - because they had been involved in a similar brawl the previous season against Norwich - lost two points. Now we have all heard about those dodgy Scottish goalkeepers. When Aberdeen visited Motherwell for a Scottish Premier League fixture in October 1999 not many goals were expected. Aberdeen had lost all their previous seven League matches that season, scoring just a single goal in those matches. The opposing goalkeepers that day were the two top Scottish keepers of that era - Andy Goram and Jim Leighton. So Aberdeen won 6-5. It was announced that the clubs who took part in the 2016/17 Champions League shared £1.25 billion in payments from UEFA. Leicester City in their debut season in the competition were the second biggest earners with £73.2m with the Foxes being ahead of winners Real Madrid (£72.6m) but behind runners-up Juventus (£98.6m). The biggest portion of the payments related to television money which was based on the TV deal operating in the country of each club. Funnily enough I had just been reading an Oxford United programme from 1986 just after they had won the Milk Cup (League Cup) at Wembley. For winning the 'biggest team prize in British sport' their bank balance was better off by £72,000. Beaten finalists QPR collected £55,000, the beaten semi-finalists £18,000 each down to the First Round losers who each received £1,750. Times have certainly changed! The harm that can be done to football clubs by rich 'saviours' was evident on this day in 2005 when former Darlington owner George Reynolds was jailed for 3 years for tax evasion. The court heard that he was virtually penniless which was a far cry from when the one-time safe-breaker joined the club and promised Premier League football and actually delivered an amazing 25,000 capacity stadium. What followed was Darlington going out of the League and then going out of business. They reformed and and currently play at the home of Darlington rugby club. Blackpool's best First Division result in the 1966/67 season came on this day in 1966 when they thumped Newcastle United 6-0 at Bloomfield Road. What made the result even more impressive was the fact that it was also their only home League victory of the season. They finished bottom! Travelling home after a session with the Stoke physio Gordon Banks was involved in a car accident which cost him his sight in his right eye and ended the playing career of one of the best goalkeepers the world has known. It's always good to see foreign players try out some of the British traditions but when Manchester City's Mario Balotelli and friends decided to celebrate Guy Fawkes Night it hit the national headlines. No, not because he got the date wrong more to do where they let the fireworks off - in his bathroom! The resulting fire caused a reported £400,000 of damage to his rented home. The incident happened in the early hours of the day before a reasonably important Premier League fixture for City - against Manchester United at Old Trafford although amazingly it proved to be the perfect preparation for the fixture - Balotelli scored twice in City's 6-1 victory. A 100,000 Wembley full-house saw England celebrate the centenary of the FA with a 2-1 victory over a Rest of the World team which included Lev Yashin, Alfredo Di Stéfano, Eusébio and Ferenc Puskás. Jimmy Greaves and Terry Paine were the England scorers, Denis Law replied for the visitors. Less than two months after the Old Trafford faithful had witnessed Manchester United's 8-2 demolition of Arsenal the boot was on the other foot in another Premier League match at the Theatre of Dreams - Manchester United 1 Manchester City 6. Five players – George Armitage, captain Claude Ashton, Billy Austin, Frank Hudspeth and Sydney Puddefoot made their England debuts in the 0-0 draw against Northern Ireland in Belfast. Puddefoot was the only one of the five to play for England a second time! When the then Harrods owner Mohamed Al-Fayed bought Fulham in 1997 he said he would see them in the Premier League in five years time - and to be fair he put his money where his mouth was. On October 24th 1997 Fulham shattered their club record transfer fee paid when they bought Paul Peschisolido (the husband of Karren, sorry now Baroness, Brady) from WBA for £1.1million, the first million pound purchase by a third tier club. Just a week previously The Cottagers had set their previous record fee paid when buying Ian Selley from Arsenal for £500,000 (a broken leg saw him play only 3 League matches for Fulham) while in early December 1997 both Fulham's and the divisional record were shattered when the Londoners bought Chris Coleman from Blackburn Rovers for £2.1million. Fulham were playing in the Premier League in 2001 and later Chris Coleman progressed to club manager after an injury ended his playing career. Manchester United beat Arsenal 2-0 at Old Trafford in the Premier League, amazingly Arsenal's first League defeat since May 2003. Since then the Gunners had gone a record 49 League matches without defeat, including the whole of the 2003/04 season. 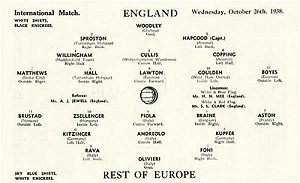 England beat Portugal 2-0 at Wembley to qualify for the 1962 World Cup Finals – Burnley players John Connelly and Ray Pointer were the scorers. England didn’t play another World Cup qualifier for 11 years – they were hosts in 1966 and holders in 1970 (wouldn’t it be great if either of those were true again!). 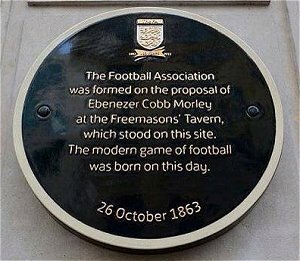 October 26th 1863 is seen as the starting date of organised football when at a meeting at the Freemasons’ Tavern in London’s Great Queen Street the Football Association was formed. It has been English football’s governing body ever since and was the first such organisation in the world. In 1938 England had still to enter the World Cup but when they beat a Rest of Europe side 3-0 at Highbury in a match that marked the 75th birthday of the Football Association many thought we didn’t need to bother. The visitors included five Italians in their line-up – Italy had retained the World Cup earlier in the year – and so England had to be the best in the world. Ignorance can be bliss! Considering that it is our national Stadium, Wembley was a tad slow to introduce floodlights. 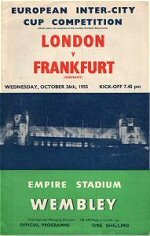 They were installed at a cost of £22,000 with the first match under floodlights being an Inter-Cities Fairs Cup match between a London representative side and Frankfurt on Wednesday October 26th 1955. England’s men suffered their worst defeat in Hungary but on this day in 2005 England’s womens team achieved their record victory – 13-0 away to Hungary in a qualifying match for the Women’s World Cup finals of 2007. Eight England players got their names on the scoresheet in the match with Kelly Smith scoring a hat-trick. Chesterfield celebrated one of their greatest ever victories – in the Anglo-Scottish Cup - but it was against mighty Rangers in the quarter-finals of the competition. 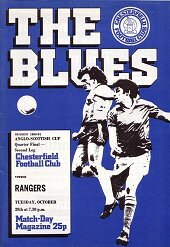 After drawing the first leg at Ibrox the return was played at Saltergate on this day in 1980 and 13,914 Chesterfield fans saw their side beat Rangers 3-0 on their way to eventually winning the competition in its final season. World Cup wins are just like buses aren’t they – you wait 51 years for a win then two come along in just 139 days! After England’s Under 20’s World title in June the Under 17s won their world title in October – and didn’t they do it in style! They beat Brazil in the semis thanks to a Rhian Brewster hat-trick - he also scored three in the quarter-finals and went on to win the tournament Golden Boot award – to set up a final against Spain. England had been beaten by the Spanish in final of the UEFA Under 17 competition in May and history looked to be repeating itself when Spain took a 2-0 lead in the World final played in Kolkata in India. But then things changed with goals from Brewster, Gibbs-White, Foden (2) and Guehi seeing England dominate to record a memorable 5-2 win. Team team - Curtis Anderson (Manchester City); Steven Sessegnon (Fulham), Joel Latibeaudiere (Manchester City), Marc Guehi (Chelsea), Jonathan Panzo (Chelsea); Tashan Oakley-Boothe (Tottenham Hotspur), George McEachran (Chelsea); Phil Foden (Manchester City), Morgan Gibbs-White (Wolverhampton Wanderers), Callum Hudson-Odoi (Chelsea); Rhian Brewster (Liverpool) with the playing subs being Nya Kirby (Crystal Palace) for Gibbs-White, Conor Gallagher (Chelsea) for McEachran and Angel Gomes (Manchester United) for Oakley-Boothe. Head coach – Steve Cooper. 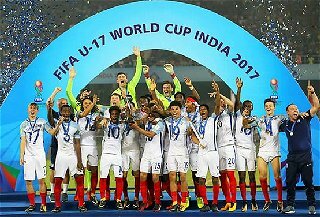 The England development teams had a magnificent 2017 – World titles for the Under 17s and Under 20s while in UEFA Euros the Under 19s won their title, the Under 17s were beaten finalists and Under 21s were beaten semi-finalists. Surely the England senior side will be winning World cups with ease in the future!! In their 2-1 National League North win at Bradford Park Avenue Salford City's goalkeeper Max Crocombe was sent off for something he later apologised for saying that he 'was in a very uncomfortable position and made an error of judgement'. His crime? Well with a few minutes remaining he was caught short and urinated on the pitch in front of some very unchuffed supporters! Link - Pitches, and what they have had to put up with. England have only had three internationals abandoned in their history and only one of those was a competitive match. On this day in 1975 a Euro qualifier in Bratislava against Czechoslovakia was abandoned after 17 minutes because of dense fog with the score at 0-0. The match was restaged the following day, England losing 2-1. An amazing match at Blundell Park where Grimsby beat Burnley 6-5 in a Division 1 fixture. Eight players scored goals in the match with the scoreline progressing 1-0. 1-1, 2-1, 2-2, 3-2, 4-2, 4-3, 4-4, 5-4, 6-4 and then 6-5. Burnley were no strangers to heavy League defeats in 2002/03 although amazingly their four other major reverses were all recorded at their own Turf Moor home. They lost 2-5 to Reading, 2-6 to Rotherham, 2-7 to Sheffield Wednesday and 4-7 to Watford. Relegation form you might think but in fact Burnley finished a little below mid-table in 2002/03. Link - Burnley results and table 2002/03. A player who perhaps shouldn't have got away with the statement 'I'm off to the match this afternoon, darling' was Southport's Billy Holmes. Married in the morning of Saturday 30th October 1954 the afternoon saw him playing for Southport against Carlisle United in a Division 3 North fixture - and he scored a hat-trick in Southport's 4-1 victory. Don Revie managed England for the first time and goals from Mick Channon and Colin Bell (2) gave England an impressive 3-0 win over Czechoslovakia in a Euro qualifier at Wembley. Revie's England side didn't concede a goal in his first six matches in charge and were unbeaten in his first nine (including a 2-0 defeat of West Germany) but exactly a year on - 30th October 1975 - England lost for the first time during Revie's reign away to the Czechs in the return match. Czechoslovakia went on to win the qualifying group and then the tournament itself for the only time in its history. Arsenal were 4-0 down after just 37 minutes of a Capital One (League Cup) tie at Reading but the Arsenal fans weren't despondent and sang 'We're going to win 5-4'. But they were wrong - Arsenal won 7-5. When the Football Association replaced Graham Kelly with Adam Crozier as chief executive in January 2000 they hoped that the skills that seen him become CEO of advertising giants Saatchi and Saatchi would help bring the FA into the 21st Century. And to be fair despite having no experience in football - and being Scottish! - he oversaw some major changes and achievements in the organisation running much of English football. During his tenure the FA moved their HQ from Lancaster Gate to Soho Square, England controversially employed their first foreign manager (Sven-Goran Eriksson), the management structure was dramatically streamlined with the FA becoming more commercially aware, the Wembley Stadium rebuild project went from a dream to reality....and England won 5-1 in Germany! But he also had his critics. In October 2002 in newspaper articles Ken Bates said that Crozier was 'hopelessly out of control' and had 'exceeded his authority' and several days later - on October 31st 2002 - Adam Crozier resigned his £613,000 FA job. He later became CEO at Royal Mail and ITV and was replaced at the FA by Mark Palios. Monthly pay doesn't seem real until you've had a chance to look at the payslip but for Liverpool's John Arne Riise on this day in 2007 his monthly pay became real for anyone with an internet connection. A copy of one his monthly payslips mysteriously appeared on the net and proved very interesting reading. A monthly basic of £120,000 plus £4,000 appearance money, £250 points bonus and £15,384.62 for the Champions League making a total of £139,634.62. Deductions totalled £57,220.95 - tax £55,508.28, NIC £1,611.67 and meals and tickets £101 leaving take-home of £82,413.67....for the month! How on earth he could make ends meet with that is beyond me!